Versailles ag ed plant and animal science class has been busy preparing for the greenhouse. Pictured (l-r) are Carter Luthman, Dalton Hesson, Austin Hecht, Logan Winner, Sara Mincer, Jack Barga, Autumn Petitjean, Abby Petitjean, Kameron Marchal, Cole Prenger, Lucy Tuente, Caden Buschur and Anna Dirscken. 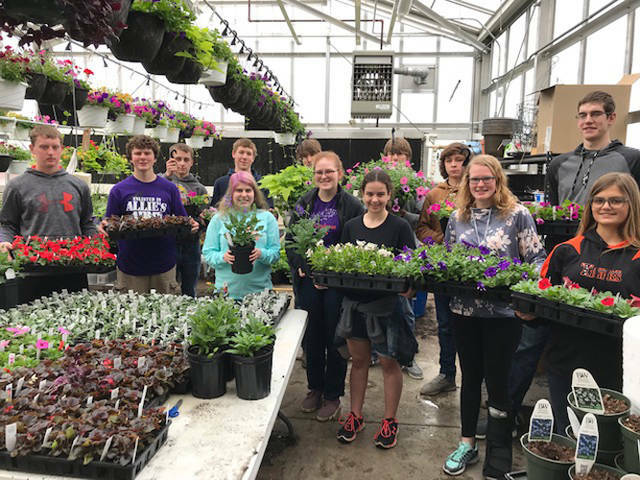 VERSAILLES – The Versailles Agricultural Education Department and FFA Chapter will conduct their eighth annual Greenhouse Sale starting April 26. The greenhouse will be open from 2:30 to 5:30 p.m. on Mondays through Fridays, open Saturdays 8:30 a.m. to 12:30 p.m. and closed on Sundays. The greenhouse is located on the west side of Versailles Schools at 280 Marker Road, close to the auditorium. From 8:30 a.m. to 2 p.m. May 11, Versailles FFA will conduct its eighth annual Greenhouse Open House. The open house will consist of door prizes, plant sales, discount specials on plants and refreshments. Special activities will be planned for children who attend the open house. The annuals for sale as part of the greenhouse include Begonia: Cocktail Mix and Whopper Bronze Leaf Rose; Dusty Miller: Silverdust; Impatiens: Accent Prem White, S.E. Lipstick, S.E. Mix, Xtreme Red; Marigold: Safari Mix; Petunia: Wave Easy Pink Passion, Wave Easy Red, Wave Purple Improved; Salvia: Victoria Blue; Vinca: Cora Cascade Apricot; Angelonia: Angelos Blue, Angelos White; Geraniums: Bright Pink, Bright Red, Salmon, White; Lantana: Luscious Bananarama, Lucious Berry Blend; Pennisetum: Rubrum; Petunia Veg: Supertunia Black Cherry, Supertunia Bordeaux, Supertunia Honey, Supertunia Latte, Supertunia Royal Velvet, Supertunia Vista Bubblegum; Verbena: Superbena Purple; Vinca Vine; Euphorbia Diamond Frost; Ipomoea Blackie, Margarite(sweet potato vine); Ageratum Hou: Bumble Blue; Bacopa: Jumbo White; Dahlia: Hypnotica Prism Mix; Spike; Petunia; Headliner Night Sky, Pink Sky. The Perennials available in 1-2 gallon containers include Buddleia: Monarch Prince Charming; Heuchera: Primo Wild Rose; Hosta: Old Glory; Salvia: Fashionista Midnight Model. The vegetable plants available include tomatoes, cabbage, peppers, melon, cucumbers, broccoli, squash, zucchini, watermelon and a variety of herbs. Hanging baskets will be available in 10- and 12-inch pots. A variety of planted pots also will be available. Versailles FFA also will fill customers’ pots and customers will be charged for the flowers that are planted. Individuals can contact Dena Wuebker or Taylor Bergman to drop off pots to be filled. Versailles FFA can start filling pots now. Anyone with questions may email Versailles FFA Adviser Dena Wuebker at dena.wuebker@vtigers.org or Versailles FFA Adviser Taylor Bergman at taylor.bergman@vtigers.org.